Special offer for graduate students from Child Therapy Toys! Putting yourself through graduate school is increasingly expensive and many of us recall the days of living on pasta and hot dogs just to try to stay above water. 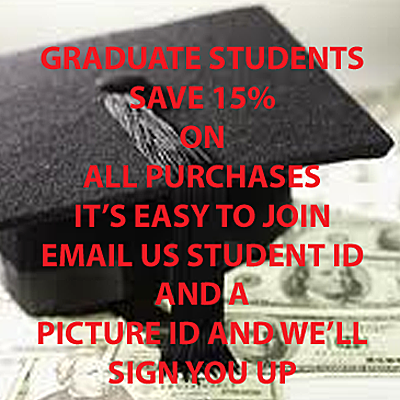 We at ChildTherapyToys.com do at least and that’s why we’re offering a 15% discount for graduate students. Just drop us a line at support@childtherapytoys.com. Be sure to include a student ID and a picture ID to match and we’ll sign you up! Capella University’s Center for the study of Play Therapy was recently deemed an Approved Center of Play Therapy Education by the Association for Play Therapy, making it one of the few online universities to claim this unique status. Read more about it here, and check out our resources page for more info on upcoming workshops and other Play Therapy training opportunities. WORKSHOP PRESENTERS and CONFERENCE ORGANIZERS: childtherapytoys.com is committed to promoting child and play therapy. We have instituted a discount program for all attendees to a workshop or conference on child or play therapy. Conference organizers and workshop presenters may contact us for a discount code to pass on to their attendees. We also have a limited quantity of fabric bags available for Conference organizers to hand out at check-in. Bags are 13 in. wide, 15 in. tall, and 10 in. deep. Bags are black and reusable. Email requests for discount coupons and bags to gary@childtherapytoys.com. Include a program description, number of attendees, and target audience.